On December 15, 2010 the functionality to upload a video to Yahoo! Video was removed and a download utility, available through March 14, 2011, was added to users’ video profiles to allow retrieval of content. The user-generated content will be removed from Yahoo! Video on March 15, 2011. We apologize if this causes you any inconvenience. Unable to compete with YouTube and even Facebook for traffic to its video site, it appears that Yahoo is shifting focus away from user-generated content. But it’s unclear what Yahoo Video will become. Of course, Yahoo is hoping that its photo-sharing site Flickr will become a popular destination for videos. Flickr turned on the ability to upload videos back in 2008. Unfortunately, Yahoo has yet to update the page where it explains “What is Yahoo Video:” Yahoo! Video is a destination where you can upload, share videos, and watch millions of other videos from across Yahoo! 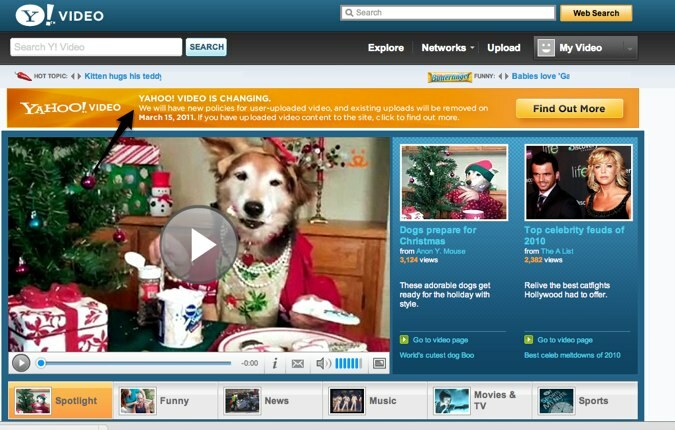 Find videos that users have uploaded, as well as premium content from our partners and other Yahoo! properties. Clearly, this has not been a stellar week for Yahoo, which just announced a round of layoffs at the company. After careful consideration, we will be removing all general user-generated content upload capability and user-uploaded video from Yahoo! Video. As a result, your videos, user profiles, ratings, favorites, and playlists will no longer be available after March 14, 2011. User video content from Yahoo! Video that remains embedded on third party sites will no longer be playable after March 14, 2011. Available on your profile page is a software utility that will allow you to download the videos you have uploaded to Yahoo! Video to your computer through March 14, 2011. You can find your profile by clicking on the \’My Video\’ tab or going to http://video.yahoo.com/mypage. Once you download your videos, you may choose to upload them to another site such as Flickr, which now allows video uploads. You can find out more here: http://www.flickr.com/explore/video. Thanks for your understanding and thanks for being a part of Yahoo! Video. If you have any questions about this change, please visit our FAQ section, or contact Customer Care.